Sport fishing is one of the most poplar activities in Loreto. A wide variety of marine species are available to catch most of the year. Thanks to an increasing demand, this sport is also a main support of the local economy. Local businesses offer the tourists different options, from affordable rental of boats and and pangas to luxurious yachts and cruisers. They offer fishing trips, sightseeing, kayaking and diving with complete and comfortable conveniences. The exotic nature of the marine species you can catch from Loreto beaches are the main motive for thousands of tourists coming every year to this destination. On e of the most wanted species is the beautiful Dorado. Followed by Blue Marlin, the Swordfish which demand experience and endurance for catching. We also have many other species which are very fun to catch, such as Tuna, Carbrilla, Wahoo, Jurel, pargo, Sierra, Mero, Pezgallo, Grouper and others. There are rules inside the Marine Park of Loreto that govern sport fishing. We ask you to choose service lenders that are well trained as they will provide you with all the current information, such as permits, licenses, etc. Your only concern will be to have fun! You don’t need to have a lot of experience to enjoy being on the water. The small species offer great fun for amateurs that just want to fish for relaxation and enjoyment. David Noel and Ginni Callahan love kayaking in Baja, so much that they’ve built their lives around it. 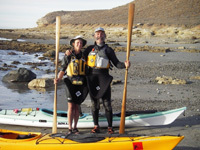 David and Ginni opened Sea Kayak Baja Mexico in 2007 with the help Baja Boss Business One Stop Solutions. Ginni has been guiding in Baja for 11 years, and is a British Canoe Union North America (BCU) sea kayak coach Level 4. Sea Kayak Baja Mexico is the only BCU-endorsed kayaking center in Mexico and is also Mexico’s only Nigel Dennis Expedition Centre. With this valuable support, Ginni and David provide kayak instruction and expeditions for those with basic experience looking to enhance their skills and challenge themselves on longer and tougher expeditions than other kayaking companies offer. All of their kayaks are singles of British design (skegs instead of rudders). Enjoy a course in the Sea of Cortez or in the surf of the Pacific! The photo is from the beginning of a trip down 60 miles of central Baja’s Pacific coast in early 2007.